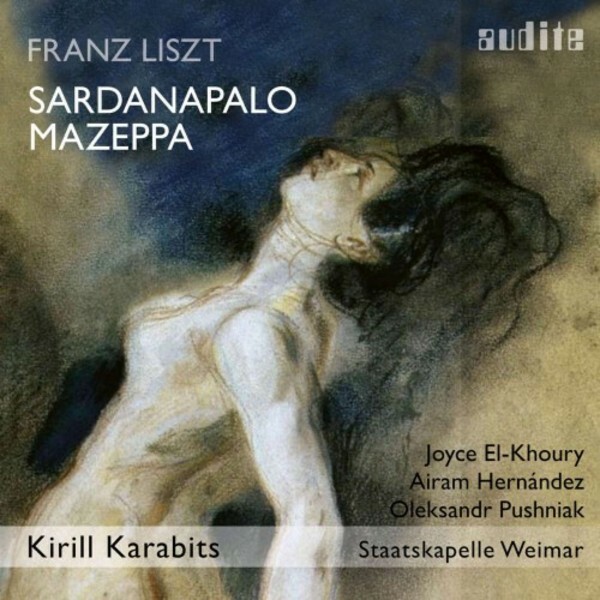 Contrary heroes: the symphonic poem Mazeppa and the opera fragment Sardanapalo performed by Kirill Karabits and the Weimar Staatskapelle. Sardanapalo who prefers wine and concubines to politics and warfare, and Mazeppa, who dies with glory, having endured pain and humiliation: dramatic literary models, impressively set to music by Franz Liszt. Written at the same time, these works represent Liszt�s ideas striving to unite literature and music, on the one hand modernising Italian opera and on the other advancing towards the symphonic poem in his orchestral writing. Kirill Karabits conducts the Weimar Staatskapelle: Liszt�s orchestra in the city in which he composed the opera. Audite continues its series of the great Weimar Kapellmeister-composers. This first-ever recording offers a fascinating glimpse of what might have been. Joyce El-Khoury and Airam Hern�ndez are the singers bravely taking on the challenging lead roles and the Staatskapelle Weimar conducted by Kirill Karabits revels in the Gothic excess of Liszt�s only mature operatic score. The tone poem Mazeppa makes a comparably rousing filler.